The following is a message from the Food Forest Citizens Working Group to the signers of a petition seeking approval for the project. The petition was directed to Mayor Caldwell and Parks & Recreation director Toni Robinson. Fiscal year 2013 has come to an end with neither approval nor release of budgeted funds for a food forest at Kamaliʻi Park. We are closing the petition, but wanted to give you a short update on what happened and also why we remain encouraged. Recall that the 2013 fiscal year opened with $50,000 in the city council’s budget for a food security pilot project — a food forest at Kamaliʻi park. Money in the council’s budget does not necessarily mean the city administration will implement a project. That is why we worked to gain support from the Downtown Neighborhood Board and many community partners, as well as demonstrate support from the public at large through petitions. Between the online and print petitions, over 1,000 people — including you — registered their support for a food forest at Kamaliʻi Park. Thank you for affirming a vision of what this little triangle of land downtown could become. Despite the public support, we were not able to secure project approval in time for the budgeted funds to be released by the end of the fiscal year. Appeals to the mayor’s office to consider how well the project fit with some of the mayor’s top priorities were drowned out by a conflict between the mayor and the council over earmarks in the city budget. We were directed to a Grants In Aid application process for the new fiscal year, but were then told that permission for the project should be in hand before applying for funds. Although we encountered many hurdles, this was a great learning process. 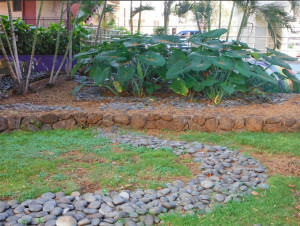 Kuhio Mini Park is on Kuhio Ave near Liliuokalani Ave in Waikiki. 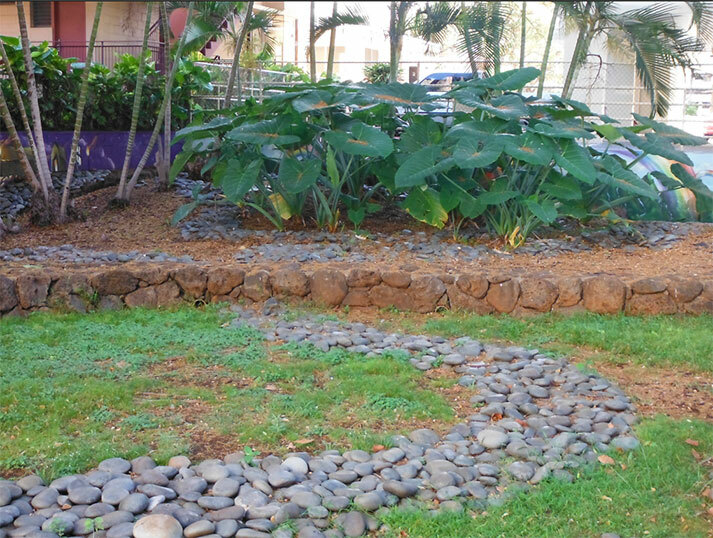 We also learned more about a successful project at a previously problematic mini park in Waikiki: Kuhio Mini Park. One of the reasons that park has become such an inviting and inspirational space is because project proponents thoroughly explored the history of the land. Sensitivity to the place and its stories allowed the project unfold in a way that surpassed the expectations of those involved. We have been at this for just a year. Following the example at Kuhio Mini Park, we will be digging deeper into the rich history at Kamaliʻi Park, continuing a dialogue with project partners, and hoping to discover what this place wants to become. Thank you again for your support and please visit http://www.kamaliipark.org for updates.